(NaturalNews) By limiting your intake of certain fish, and eating complementary foods that remove mercury from your system, you can enjoy the benefits of consuming seafood without endangering your health, as revealed in Mike Adam's new book, Food Forensics, which will hit all the major booksellers on July 26. Mike "The Health Ranger" Adams is the founder/editor of Natural News, and his new book, Food Forensics: The Hidden Toxins Lurking in Your Food and How You Can Avoid Them for Lifelong Health, contains valuable information regarding mercury levels in fish, as well as how to keep your exposure at safe levels without having to give up eating seafood altogether. The health benefits of a diet that includes fish are well-known. Fish is a great source of protein, nutrients and vitamin D, not to mention being the best source of omega-3 fatty acids, which prevent heart disease, and are essential for the growth and development of the brain and body. Nearly all fish contain mercury, however, so it's important to know which fish contain the highest levels. "Because the oceans are polluted with it, methylmercury is typically found in fish and shellfish. The larger the fish and the longer the lifespan, the more mercury is accumulated; the most contaminated include tuna, swordfish, king mackerel, and shark. 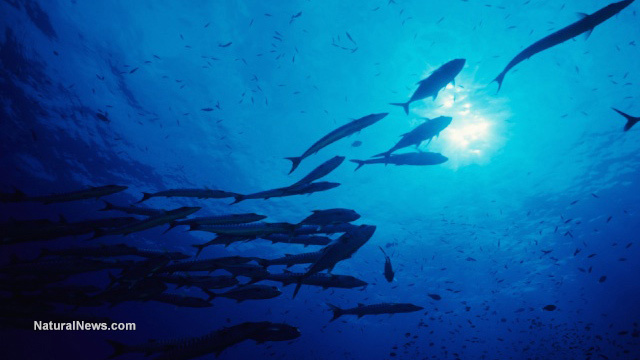 The EPA warns that nearly all fish are tainted with at least trace amounts of mercury. Some of the more health conscious grocery stores even include warnings on store shelves about methylmercury in tuna, and many recommendations caution people from eating tuna more and many recommendations caution people from eating tuna more than once a week (pregnant women are cautioned to eat it sparingly, if at all)." 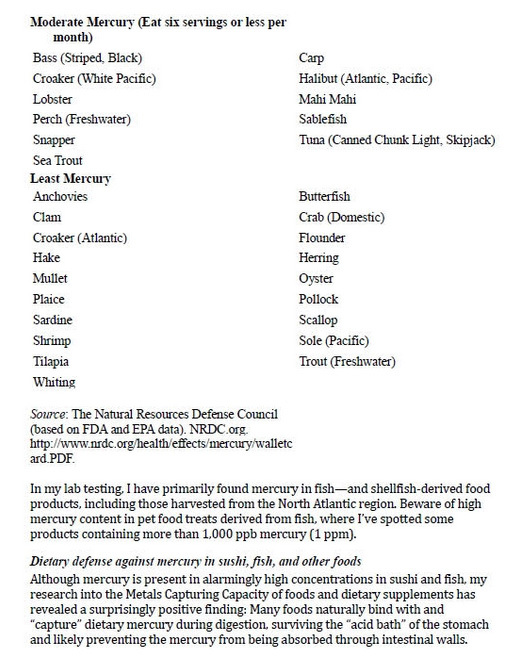 In the graph below, taken from Food Forensics, you'll find a listing of the fish that typically contain moderate levels of mercury and the ones that contain the least mercury. The good news – as mentioned in the last paragraph under the graph – is that many foods and supplements are capable of capturing mercury during digestion, keeping it from being absorbed by the body. "In fact, mercury is the easiest of all heavy metals to capture in this fashion, and seaweeds tend to have very high efficiency in capturing free mercury during digestion. Even the nori seaweed often used in sushi is able to capture around 85 percent of dietary mercury, according to my lab tests. Other seaweeds are more effective, however. One brand of dulse seaweed, for example, showed an ability to capture 99 percent of dietary mercury. "In the lab, mercury is well known as a 'sticky' element that sticks to everything, including sample tubing on laboratory equipment. This stickiness makes mercury easy to capture in the gastrointestinal tract using natural foods that contain insoluble fibers, such as fruits and vegetables. "Nearly all whole foods containing natural fibers show some affinity for capturing elemental mercury, including cereals and fruits. Strawberries and camu camu were the most effective fruits for this purpose, and nearly all grass powders (such as alfalfa grass powder) and chlorella superfood supplements showed high affinity for mercury. "The 'Metals Defense' formula I developed at the lab captures nearly 100 percent of elemental mercury, leaving almost no mercury available for absorption during digestion. (See the full laboratory details on this formula at HeavyMetalsDefense.com.)" To learn more about mercury exposure, and a lot more about food toxins in general, be sure to order your copy of Food Forensics today. By doing so, you will become part of the "Food Revolution," and you'll be helping to support further research by the Health Ranger regarding food safety and awareness. Join the fight for "food transparency, honest ingredients and clean food!"